Holy crap, this was a mind-blowing episode, easily one of the best so far! Picking up directly after Hawkeye's encounter with Gluttony, Mustang's team, along with Barry and Al, begin a chase through the streets of Central, eventually ending up at the Third Laboratory. Once inside, the team splits into two groups, and Havoc and Mustang have an unfortunate run-in with Lust. Havoc is made aware of the fact that he's been dating a Homuculus, and while Mustang chastises him for falling for her large breasts, Havoc assures Mustang that he never revealed any military information to Lust. Mustang attempts to kill Lust, but he quickly learns of her regenerative abilities and both Mustang and Havoc are gravely wounded. Lust then makes her way to the room where Al, Hawkeye, and Barry have discovered a gate that bears a striking resemblance to the one Ed and Al encountered when they first met Truth. Lust quickly disposes of Barry, and deals significant damage to Al's body. Hawkeye is all but defeated, but Al tries desperately to protect her. Just as it seems Lust has won, Mustang appears in the doorway, holding his side. He has carved a transmutation circle on the back of his hand and seared his wounds shut with alchemy. Mustang recites Lust's statement that he cannot kill her, but follows up by saying that he'd like to try. One flame explosion after another engulfs Lust and - for the first time - we see Lust in agonizing pain, her body contorted and skeletal as Mustang reduces her to ash. Before admitting defeat, Lust leaves Mustang with an omen of sorts. As action-packed as this episode was, I admittedly found myself a bit disappointed to see Lust killed off already. However, this turn of events served the overarching story beautifully. Ed encounters his father visiting Trisha Elric's grave. The two have a brief conversation, though nothing like Ed punching his father results from of it (unlike with Hoenheim's return in the 2003 series). That night, Ed overhears Pinako and Hoenheim conversing about the body that the Elric brothers transmuted, which leads Ed to question whether or not it was actually that of Trisha. The next day, Pinako assists Ed in digging up the body. She tries to convince him to head indoors to avoid the rain, but Ed is determined to resolve this matter. Ultimately Ed comes to find that, not only was the body not Trisha's, but its bone structure appeared to be that of a male. Pinako tries to comfort Ed, since he now realizes there isn't any way to bring the dead back to life. But at the same time, Ed is both relieved that he and Al didn't kill their mother twice over (which he relays to Izumi, comforting her as well), and hopeful that Al's body might still lie somewhere within the Gate. This was a particularly dark episode that - opposite the previous - places the majority of its focus on Ed. Though Hoenheim only does so much, it's clear that his story will start to take shape in due time. Ed decides that, as Scar has been reported in Central again, putting himself at risk by engaging Scar in combat should draw the Homunculi out. Ed, Al, and Mustang become suspicious of Bradley, who (in a very out-of-character fashion) reveals himself to Ling. Meanwhile, Breda seeks out Dr. Marcoh, only to find that he has been kidnapped, while Havoc argues with Mustang that his paralysis renders him useless to Mustang's goal of becoming Fuhrer. Mustang retorts that he will leave Havoc for now, but will come back for him in time. There was quite a bit to keep balanced in this episode, and while I think a decent job was done, it felt like there was too much being juggled at a few points. It might have been easier if the story had focused almost exclusively on Mustang and co. Finally, Scar's backstory is explored. I really enjoyed how this played out in the 2003 series, and the Brotherhood counterpart did not disappoint. True, it was a condensed version, and Scar's brother was not shown to be driven to the brink of insanity, but the episode covered all the necessary bases before its conclusion. Admittedly, I prefer the 2003 series' explanation for how Winry's parents died and the inner turmoil it caused her. But facing Scar in an alley, gun in hand, Winry obviously lets the thought of her parents dying at his hand weigh just as heavily. In the end, Ed convinces her to drop the gun, which - as predictable of a conclusion as this episode had - was paced very well. With Lan Fan injured, Ling finds himself at a disadvantage against Gluttony and Bradley. Lan Fan decides to cut off her own arm in order to throw off Bradley's all-seeing eye, leading him to a dead end. Ling and the Elric brothers - with help from a disguised Hawkeye - cut Gluttony down to size just long enough to capture him using coils transmuted from train rails, so that when he attempts to regenerate his body he gets stuck. While Hawkeye and Ling make a break for it with their captive Homunculus, Ed and Al try to stop Scar (who has been shot in the leg), but May Chang comes to Scar's rescue and the two escape after rendezvousing with Yoki. Winry returns to Rush Valley, while Mustang, Hawkeye, Ed, Al, Ling, and Lan Fan meet up at Dr. Knox's safe house with the hope that he can treat Lan Fan's wounds. Upon hearing Mustang's name, however, Gluttony goes berserk and destroys a portion of the house, his belly and mouth opening to reveal a black void with a single eye in the center (not unlike the one Ed and Al encountered when they tried to resurrect their mother). It seems Dr. Marcoh is now in the custody of the Homunculi as a potential sacrifice. Ed, Al and Ling stay behind in the forest to fight Gluttony, while Mustang, Hawkeye, Dr. Knox, and Lan Fan head towards Central. Envy arrives on the scene shortly thereafter, having kept a close eye on things from a distance in the form of a dog. The fight continues on for a while until Gluttony swallows Ed and Ling, and Envy - knowing how important Ed is as a potential sacrifice - jumps in after them. Honestly, this episode felt like it dragged on for a while, as not a whole lot happened. The most exciting portions were at the end, specifically when Mustang takes Hughes advice on figuring out who he can and cannot trust to heart. Unfortunately for Mustang, this gets him into a very difficult situation, and it is revealed that there are higher-ups in the Amestrian military who support Bradley knowing full-well that he is a Homunculus. No one would ever accuse Gluttony of being particularly smart, but his ignorance becomes strikingly apparent to Al in this episode. Gluttony realizes he wasn't supposed to swallow Ed or Ling, but realizes 'his father' will be able to fix this problem. Gluttony thinks letting Al follow him will be even better, since he and Ed have been pegged as potential sacrifices by the Homunculi. Fuhrer Bradley admits his being a Homunculus to Mustang, and punishes him by splitting up his team, reassigning Hawkeye as his personal assistant in order to keep a closer eye on her and a tighter leash on Mustang. Meanwhile, Ed and Ling have a bit of a comedic romp through Gluttony's belly as they try to find a way out. Eventually, Envy finds them and explains that Gluttony was a failed experiment to create another Gate. He then goes on to explain in greater detail the events of the Ishbalan Civil War, stating that he was the one that killed the young girl, masquerading as an Amestrian soldier. As Envy relishes in the memory, Ed attributes Envy's actions to causing Scar to become a murderer and the death of Winry's parents. But when Ed tries to deal punch to Envy, Ling remarks how heavy Envy seemed during their earlier skirmish in the forest, and Envy reveals his true form - a grotesque, if not incredibly befitting, green dragon. As Ed and Ling engage dragon Envy, Gluttony presents Al with a disturbing surprise - the Homunculi's father is living in Central. Envy's actions in this episode make a complete 180 (which struck me as a bit odd), as he begins by fighting Ed and Ling, bombarding the eldest Elric brother with the agonizing cries of the people of Xerxes, the souls of whom are apparently trapped in the reptilian body that is Envy's true form. By the end of the episode, however, Envy helps Ed to collect the missing pieces of the mural Ed saw at Xerxes (those pieces having been spread throughout Gluttony's stomach). Ed then decides he will perform a kind of human transmutation on Ling, Envy, and then himself, deconstructing their bodies and then reconstructing them outside of Gluttony. There are a number of nods to works like Dante's Inferno throughout this episode, which work quite well in conjunction with the recounting of the destruction of Xerxes. Meanwhile, Scar and May Chang follow Al and Gluttony as they seek out Father, fighting hordes of chimeras deep below Central. But perhaps the most interesting aspect of this episode's narrative is Bradley's recollection of when he first became a Homunculus. Unlike the others, Bradley was once a human, a candidate to be the country's next Fuhrer, and was the only one to survive being infused with Father's wrath. Bradley tells Mustang that he isn't actually certain if the soul he carries now is his original human soul or one of the many held within the philosopher's stone. While Bradley's lecturing Mustang has dragged on for a while now, it finally played out in a very satisfying, if not incredibly dark, manner. Finally, the episode's conclusion delivered a brilliant twist as Ed travels through the Gate once more, only this time he encounters his brother's body. As the Gate drags Ed through to the other side, he fights back long enough to shout to Al's body that he will return someday soon. Al smiles, and the Gate slams shut. For as brief as this segment was, it was perfectly executed, and others in the anime industry could learn a thing or two from this series about how to deliver a story. Below is the trailer revealing the eight playable characters in Resident Evil: The Mercenaries 3D. As Capcom already illustrated, this seems to be a pretty straightforward combination of the mercenaries modes in both Resident Evil 4 and 5. Like a number of others, I have to say I'm rather disappointed that Leon is not listed, though it's possible that more characters will be available for download from the 3DS marketplace in the future. 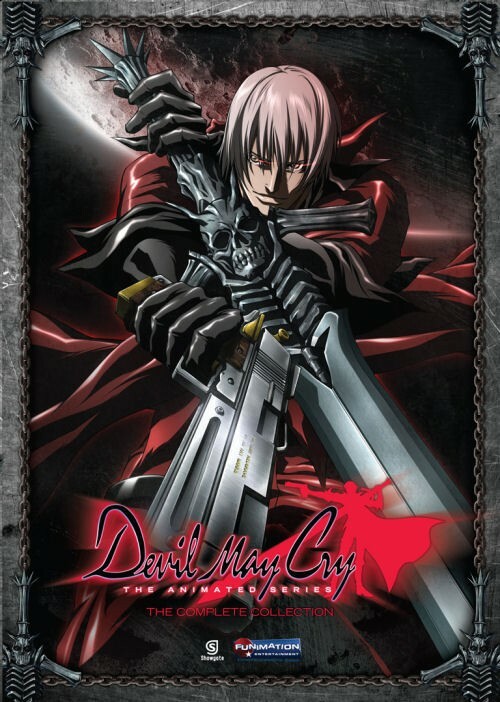 Being relatively new to the video game series off which the Devil May Cry anime is based, I found Dante's slick and chill style to be a welcome break from countless other gun-wielding badasses. Instead of trying to force a macho image on viewers, Dante is presented as an individual who is more than aware of the threat demons possess, but also has plenty of experience in dealing with them, and so he remains calm and collected as he identifies his foes' weaknesses and then proceeds to dispatch them. Early on, some of the demons show similarities, while the story is more concerned with introducing Lady, Trish, Morrison, and Patty. Overall, though, the demons themselves are quite nicely varied. Some bear more humanoid appearances, while others are as outlandish and alien as possible. There is an overarching story to everything, though the pieces don't come together until the last few episodes. None of the episodes shoot for the epic scale of any of the games, but an interesting perspective is presented as viewers witness Dante taking on smaller, separate missions with demons plauging various groups or individuals. This format ultimately allows Dante's character development to shine through, though Lady and Trish sit on the backburner with their involvement and development being minimal in comparison to Patty or the son of Sparda himself. The final episodes do throw a few story elements at viewers that don't receive much in the way of explanation, but these are all minor in the grand scheme of things. The series finale plays out over the course of two episodes. While the first half of the second episode does drag on a bit, it presents an interesting perspective on the climactic events therein, through the eyes of Patty. The finale is a bit predictable, but does a very good job of giving each of the characters enough time in the spotlight. Things wrap up nicely for the characters who are exclusive to the anime, while leaving things (understandably) open-ended for Dante, Trish, and Lady. The English dub for Devil May Cry is very well done, which may come as a surprise to some, considering Capcom's involvement in the project. I found Reuben Langdon as Dante to exaggerate pauses in his statements a bit too dramatically in early episodes, but it's a very minor drawback and Langdon cuts back on this habit as the series progresses. Luci Christian and Melissa Davis provide solid enough voices for Trish and Lady respectively, though neither of them voiced those characters in the video games so it's understandable if they aren't outstanding. Hilary Haag provides the voice of Patty Lowell, and though the young girl can come across as annoying early on, her story ultimately plays out in a rather exciting fashion, with Haag only adding to Patty's adorable and strong-willed nature. The anime series is more heavily grounded in a realistic world setting than the games are. Most of the backdrops are city streets, though a countryside village or a cruise ship prevent settings from becoming mundane. Not unlike the video game franchise it is based off of, Devil May Cry's soundtrack is comprised first and foremost of heavier new-age rock pieces. A number of classical and opera tracks contrast this, with a handful of electronic pieces making their way into the mix. When Dante is following leads on various demons, the soundtrack is a dark and moody, but when he's taking them on guns blazing, it's wild and rockin'. The pacing throughout is nearly perfect, and being a Madhouse project, the animation is stellar. It's not often that a tie-in series intended primarily for promotional purposes (in this case, alongside Devil May Cry 4) turns out to be anything more than a flash in the pan. But other companies could learn a thing or two from the Devil May Cry anime. It's not a perfect anime by any means, but it's certainly a well-rounded story that breathes the essence of what Devil May Cry is. True, it does separate itself from the games in a number of respects, but the character development benefits from Dante taking on lesser demons, and the story retains its focus instead of each episode trying to outdo the previous with increasingly epically-scaled battles. That said, the action is largely what Devil May Cry sells itself by, and there is plenty to be found in this anime. So fans of Devil May Cry, grab yourself some pizza and a strawberry sundae, because this is one smokin' series. Funimation announced this week Wednesday that they are planning to change their future retail releases of anime series. Instead of releasing on Blu-Ray and DVD seperately, the new box sets will include both. Funimation is currently holding a survey to gain feedback from consumers about the change. I understand Funimation's logic behind this move, and in all honesty it makes a lot of sense. However, my biggest concern with this is the price tag. I personally don't own a Blu-Ray player, nor do I have any intention of purchasing one in the near future. I'd certainly be willing to pay a bit more for the combo pack release, even though I presently have no use for the Blu-Ray discs, but I also have my limit on what I want to pay for anime. Say, for example, that Funimation were to issue a combo pack release of Full Metal Alchemist: Brotherhood part one. The MSRP for the DVD release of this is $40, while the Blu-Ray is around $50. If they were to offer a combo pack, I'd be willing to pay around the $50 they would normally charge for the Blu-Rays alone, or maybe even a few bucks more. However, if they decide to charge more along the lines of $90 (which would be the cost of the two separate), there's simply no way I'd be spending that much on anime. Now, knowing how Funimation operates, I imagine they've already taken this into consideration and are trying to work things out so that it benefits them as a company without screwing over their consumers/fanbase. I just found it to be an interesting move on their part, and am curious as to what others make of the change. EDIT: Upon seeing a copy of Gai-Rei-Zero (the first of these new Blu-Ray/DVD combos) at my local Best Buy, I can confirm that the price for the 3 DVD, 2 Blu-Ray disc combo pack was $49.99 (and a total of twelve episodes), which is only a bit more than the MSRP for something like thirteen episodes of FMA: Brotherhood on two DVDs for $39.99. So assuming Funimation keeps prices around this range, I will have no qualms about the new Blu-Ray/DVD combos. Portal 2 picks up some years after the conclusion of the first game. No concrete time frame is given, but it's obvious that a few years have passed, as the entire facility is in disrepair. Following her initial defeat of GLaDOS and subsequent escape, Chell has been dragged back into Aperture and placed within a long-term relaxation chamber. A brief tutorial on the games controls plays out before Chell meets Wheatley, a personality core tasked with keeping track of all the human test subjects. Wheatley promises to help Chell escape Aperture, and, after acquiring the portal gun, Chell finds herself in GLaDOS' chamber once more. Wheatley - while trying to find an escape for Chell - accidentally reactivates GLaDOS, and he and Chell are separated, with the latter being sent to retrace her steps through Aperture's test chambers. The game's introductory sequence is hauntingly surreal. While the chambers Chell traverses are familiar territory to anyone who has experienced the first Portal, the plantlife and new gameplay elements add enough flavor early on to set Portal 2 apart from its predecessor without dishing too much to players right away. New gameplay elements including lasers, repulsion and propulsion gels, aerial faith plates, and light bridges are introduced gradually as the single player mode progresses, eventually seeing a myriad of combinations late in the game. The puzzles are both more plentiful and more challenging than in the first game, but a large portion of what makes them so enjoyable is the process of solving them. Players may find it takes a few tries to successfully complete the early test chambers, while later portions of the game take more time and patience in order to complete far more complex tasks in gigantic areas. But the process of trial-and-error is far more rewarding than relying on game guides. A few tweaks have been made with regards to how the portals apply to test chamber walls. No longer do players have to try three or four times simply to line a portal up a just the right angle of rotation. It's a small change in the grand scheme of things, but it goes a long way. The cooperative multiplayer mode allows players to take on four different sets of chambers, each of which contains seven tests that become both progressively longer and more challenging. While there a variety of puzzles are presented, each area puts major emphasis on one of the new elements introduced in the single player game. For example, one of the areas focuses largely on the aerial faith plates, another on light bridges, and so on. The last few test chambers in each area then go on to combine all of the previous elements. While the multiplayer mode can be replayed time and time again (either online or splitscreen), veteran players will find a lack of challenge, simply because they've already completed each chamber. In the single player game, there are a number of hidden rooms riddled with artwork and messages from the Rat Man (aka as Doug Rattman for those familiar with the comic that bridges the gap between the two games). The game has quite a few easter eggs and clever achievements to unlock, but due to its linear gameplay, there isn't a ton of replay value presented in Portal 2. The single player game is certainly more story-driven than that of its predecessor, and utilizes more adventure elements. In contrast, the cooperative mode is a more pure puzzle and platforming experience, with a story that is plenty funny but nowhere near as memorable or fleshed out as the single player story. 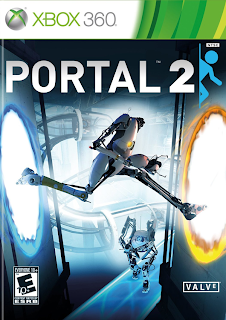 In this regard, Portal 2 offers two games in one, both deeply rooted in the core mechanics of the first Portal. Regardless of personal preference of either mode, players will find that Portal 2 is a more complete and rounded out gaming experience - something that Valve stressed from the moment they announced the sequel. The single player experience lasts roughly seven to eight hours, while the cooperative mode adds an extra five to six hours, depending on how long it takes teammates to solve puzzles. I absolutely loved the dark comedy that fueled the first game, with GLaDOS constantly balancing her love of testing and desire to murder Chell, quirky phrases from the turrets, messages left scribbled all over the Rat Man's hidden rooms, and of course the promise of cake. With Portal 2, there is a larger cast of characters, and though they come and go as the story progresses, the game is considerably funnier than its predecessor. This is due in no small part to the game's voice actors. Ellen McLain reprises her role as the devilish and calculating GLaDOS, while Stephen Merchant plays her polar opposite - Chell's robotic ally Wheatley, who causes a number of screw-ups, but is ultimately a breath of fresh air as the most human character in the game, as well as its most lovable character. J.K. Simmons provides insight into the early years of Aperture Science as Cave Johnson, the company's founder, a man who is expresses himself in both a blunt and colorful manner with some off-the-wall metaphors and vehement distaste towards limitations on science (physical, legal, or otherwise). For a 2007 release, Portal looked and sounded quite nice. But this is 2011, and Valve has gone out of their way to revamp Aperture Science with overgrown plantlife and incomplete chambers among the enrichment center's familiar white and gray sterile design. Graphically, the game isn't quite as impressive as other recent releases, but the great attention to detail and more drastic lighting and shadow effects raise the bar significantly from the original Portal. Aperture feels more alive than ever, with panels adjusting as tests are completed and chambers gradually becoming more and more complete as GLaDOS restores the facility around Chell. The feel of Portal's soundtrack is retained, but expanded upon. Instead of having a few ominous tracks throughout, Portal 2 chooses the more techno-heavy route, borrowing some inspiration from the musical stylings present in Half-Life 2. I must admit, when I first heard that Eurogamer gave Portal 2 a perfect ten score, I was a little skeptical. Sure, the first game was a huge game-changer, not only for Valve but for the puzzle and adventure genres as well. But it would certainly be a difficult act to top. After playing through both modes, I can happily say that Portal 2 is one-of-a-kind game. It still retains everything that made the first Portal great, but goes the extra mile to deliver a much more rounded out experience. Although it's still early in 2011, there's no doubt in my mind that Portal 2 stands a very good chance of earning game of the year. Valve recently announced DLC for Portal 2. No concrete release date or details have been given as of yet. If I had to take a guess, though, based on the way the game wraps up, it would seem more likely that the DLC would be additional test chambers for the cooperative multiplayer mode, or at the very least a continuation of Atlas and P-Body's story. It could also be that Valve plans to release reworked test chambers much like those that were included in the first Portal. Whatever the case, this announcement isn't terribly surprising, considering the overwhemingly positive response Portal 2 has been getting. What is a pleasant surprise, however, is the fact that the DLC will be free of charge for download on PC, Xbox 360, and PS3. Picking up directly where episode thirteen left off, Greed and his gang of chimeras evacuate Devil's Nest by way of the sewers in an attempt to escape the Amestrian military. Fuhrer King Bradley spearheads the operation, with Major Armstrong providing support. Al is the only one to see up close the Fuhrer's combat with the chimeras as he makes short work of them. With Martel still inside of Al, Roa and Dolcetto ask Al as a dying wish to get her to safety. As Martel and Al struggle with each other, Fuhrer Bradley kills her. As her blood touches Al's blood seal, some of his memories from the gate are recalled. Ultimately, Bradley is able to make short work of Greed, combating his ultimate shield with his swords and the aid of his ultimate eye, as Bradley reveals to both Greed and viewers that he is the Homunculus known as Wrath. The Elrics are suspicious of why the Fuhrer would participate in such as small operation. As it turns out, it was so that he could retrieve Greed and return him to his source, Father. This is the first we've seen of father (not including the brief cameo in episode one), and while there wasn't a lot of insight provided, it certainly gave a glimpse into the interactions between the Homunculi. Admittedly I was a bit surprised at the revelation of Bradley's identity as a Homunculus coming so soon in the story, but as Ed and Al are not aware, it will keep things interesting for some time to come, I'm sure. I would have liked to see more from the chimeras, specifically Martel, as I feel she provided an interesting perspective in the 2003 series. It's unfortunate that her appearance was so brief. Greed's portrayal differs slightly in Brotherhood. In the 2003 series he treated his followers with a great deal of respect, viewing them as something of his equals. In Brotherhood, however, it seems Greed 'puts on a face' so to speak in order to gain the trust and respect of others while he's really only out for himself. On the other hand, I very much enjoyed his sarcastic responses to Father and the insults he dished out to the other Homunculi, as well as his almost maniacal characteristics that surfaced near the episodes conclusion. Returning to Rush Valley to see Winry for even more repairs the Elrics find a young man passed out on the street and get him food. He reveals that he comes from the distant kingdom of Xing, and that he is the twelfth of fifty potential heirs competing for the throne once is father passes away. He inquires with the Elrics about the Philosopher's Stone, as he desires immortality in order to try and increase his chances of ascending to the throne. The Elrics refuse to tell him anything, but soon find themselves fighting Ling's bodyguards. The fight sequences are nicely executed and drawn out just long enough that they don't take away from the episode's primary focus. As selfish as he is, Ling proves to be a fresh source of comedy (and with regards to the English dub, I couldn't think of anyone more fitting than Todd Haberkorn to fill his shoes). A dark and depressing episode, the Elric brothers and Winry finally learn the truth about Hughes' death, despite attempts from Armstrong and Mustang to try and keep it under wraps. Ling's bodyguards lose track of him the moment their train arrives in Central, while the Elrics and Winry visit Gracia and Elysia to talk about the circumstances of Hughes' murder. Ed blames himself for getting Hughes caught up in his troubles, but Gracia assures him that Maes only ever wanted to help people and probably died with no regrets. She also expresses her belief that his death served as a warning to Ed from whoever it is that doesn't want him looking too much into the Philosopher's Stone. The 2003 series held off on wrapping this portion of the story until very late, and because of that viewers had to be refreshed on the events surrounding Hughes' death before Ed's confrontation with Mustang could come full-circle. Upon learning of the news, Ed briefly decided Mustang's withholding this information from him was unforgivable. Getting this out of the way earlier in Brotherhood avoids the extra time required to revisit the scenario in such detail and allows the characters their mourning period before picking themselves back up and moving on. Some excellent shock value from the Homunculi at the episode's conclusion made for a most satisfying cliffhanger. Lieutenant Maria Ross is named as the prime suspect in Hughes' murder, a plot orchestrated by the Homunculi. Winry expresses her concern for the Elric brothers' safety, but ultimately Al is able to cheer up her and Ed. Barry the Chopper, who has been under Falman's supervision as per Mustang's orders, sees Ross' picture in the newspaper as Falman sends a high-priority call to Mustang regarding the same situation. Barry leaves Falman's apartment, makes his way through the prison guards, and encounters Ling who has been tossed into a cell due to his lack of a visa. Barry sets Ling and Ross free, and encounters the Elrics just outside of the prison. Ed demands an explanation for all of this, but Barry tells Ross that military forces are hot on her trail and that she needs to leave as quickly as possible. Ross encounters Mustang in an alley and he is shown using his flame attack. Ed arrives to find a charred body, which Mustang claims is Ross', and that he killed her in accordance with the order of "shoot-to-kill" if she were to resist. Ed becomes enraged at Mustang's cold and collected attitude towards his own actions, and tries to punch him, but Al stops him. In the following hours, Mustang's unit begins splitting up and heading out in different directions. Armstrong arrives at Ed's hotel room and punches him. Ed is incredibly confused, yet Armstrong provides him no explanation, stating only that Al and Winry need to remain in Central as he claims he will be taking Ed to Rismebool in order to seek repairs on his automail arm. A nice Mustang-centered episode, the events therein kept me on the edge of my seat the entire time, despite the fact that I wasn't exactly certain where things were going until near the end. I have a few ideas regarding Ross' whereabouts, but I find it very hard to believe that she's dead, especially at the hands of Mustang. It would seem very out of character for him to kill someone suspected of murdering Hughes without any substantial proof. Turns out I was right - Ross is revealed to be alive and well, though not until after Ed and Armstrong meet up with Breda and Fu to make a trek into the desert to visit the ruins of Xerxes. There, Mustang's plan is revealed in full, and I daresay it is quite brilliantly executed. Present-day events in Central follow Havoc, Falman, and Barry as they fight Barry's original body, now presumed host to some animal, while Ling seeks information from Al on his body in hopes of more information on how to become immortal. While the genesis of Alchemy and Alkahestry is briefly touched on, this episode is primarily about Mustang and co. I welcome it, as Mustang has not played center stage much in Brotherhood thus far. The first half of the episode seemed to fly by, while the latter slowed down to build up for one tense cliffhanger finale. Of course, I have plenty of faith in Hawkeye's combat capabilities, but it's finally time for the Homunculi to get in on some more of the action. After the collapse of Lab 5, Ed is sent to the hospital to recover. As his automail arm is out of commission, Ed calls Winry out to Central to repair it (completely unaware that she forgot to put in one of the screws). All the while Al is contemplating Barry's insistence that he was never really a boy, merely a puppet created by Ed. This leads Al to become incredibly frustrated, spouting this out at Ed when he reaches his boiling point. It's a side of Al that isn't shown very often, but I feel that Brotherhood handled the situation better than the 2003 series did. Instead of having Alphonse run off until he eventually came to seek Ed's forgiveness, this episode placed Winry as a medium between the brothers. She is fully aware of the fact that Ed feels a great deal of blame for Al losing his body, and how he has been too afraid to ask if Al holds a grudge against him for it. By having Ed walk away, Winry explain to Al what Ed is feeling, and then ordering him to go apologize while tears stream down her face, Brotherhood's take on this scenario led me to feel a more genuine sense of emotional connection with the characters. Hughes added some lighthearted comedy, but overall the delivery of this episode was rather serious. Despite it not being particularly action-heavy, this was easily one of the best episodes since the introductory episodes of Brotherhood. I knew it had to come at some point, and while it was one of the most depressing episodes in the 2003 series, it was also one the most well-written. The same can be said about Brotherhood's depiction of the events leading up to Maes Hughes' death. In the episodes leading up to this point, Hughes didn't receive as much screentime as in the 2003 series, but this episode makes up for that, placing almost its entire focus on Hughes' dual role as a man of the military and a loving husband/father. What he uncovers this time around is different than in the 2003 series, and Envy still manages to kill him before he is able to pass word along to Mustang, but it was not in vain, as Mustang is able to gather quite a bit from the information (or lack of information) that he receives following Hughes' funeral. It was a truly sad ending and it hurt just as much to Hughes go the second time around, but the episode delivered one hell of an adrenaline rush that kept me on the edge of my seat. The Elric brothers, with Winry in tow, travel to Rush Valley, famous for its automail. Winry is ecstatic to see all the newest automail models, but things get sidetracked when a girl named Paninya steals Ed's pocketwatch. The trio manages to follow the girl to a house a fair distance outside of Rush Valley, where they meet the man who outfitted Paninya with her automail legs. Winry is thoroughly impressed with his work and asks if he would consider taking her on as his apprentice. He immediately refuses. His son's wife going into labor, the man leaves for Rush Valley in search of a doctor, while Winry - recalling some of the information she learned from her parents' books - begins issuing orders to prepare for the baby. After a successful delivery, Winry reveals to Ed that she opened his pocketwatch and saw the inscription of the date the brothers left Resembool. Ed states that he has never shared that with anyone, but made the inscription to give himself a physical reminder of what transpired there. Winry cries, and when Ed tells her to stop, she responds by telling him that since he won't cry she feels she must do it for him. Ed then tries to convince the man to take on Winry as his apprentice, to which he again refuses, but offers to introduce her to an associate of his and tells her she can stop by to visit the baby sometime. Winry decides to stay in Rush Valley with the goal of making better automail for Ed in the future, and the boys say their goodbyes as they board the train headed for Dublith. Overall this episode was fairly well paced and had a greater purpose in the overarching story, something that can't really be said for its 2003 counterpart. Winry received the primary focus which helped to develop her enough before the Elrics parted ways with her. I assume it will be a while before Winry makes a return to the forefront of the story, and peeling back another layer of the relationship she and Ed share added a bit more complexity to her story. Also, while it bears little impact on the way the episode played out, I did appreciate the brief appearances of Scar, Yoki, and Greed on a wanted poster at the train station. Greed was one of my favorite characters in the 2003 series, and I'm excited to see him make his entrance into the Brotherhood story. While I've had my complaints with past episodes being too fast paced, these two episodes handle their plots much better because of the faster pacing. As I've mentioned before, I have seen a handful of episodes on Adult Swim, and I am aware of where Greed and Izumi's stories will lead later on. But even if I hadn't been aware of what was to come, these episodes would have been equally satisfying. Instead of devoting multiple episodes to Izumi's teachings both past and present, Brotherhood covers it in one with the ultimate outcome being that Izumi disowns the Elrics as students due to a combination of the fact that they committed the taboo and that she now views them as her equals, not her pupils. A flashback to the day the Elrics first met Izumi was a welcome snippet that provided some quick comedy in an episode that was otherwise quite heavy on information and included relatively little action. Beasts of Dublith, on the other hand, required no flashbacks and included more action as Ed faced down Greed after his gang kidnapped Alphonse. Greed provided insight into the nature of the Homunculi, but refrained from giving too much away. The Chimera aren't much different than they were in the 2003 series, though there were a few brief attempts to make jokes about Dolcetto's canine nature that I felt weren't really all that funny. Overall, though, these most recent episodes seem to have found a better rhythm and are throwing in comedic moments much more sparingly. Not that I don't appreciate a joke here and there, but some of Brotherhood's earlier episodes tried to poke fun at relatively serious and dramatic situations, which led to some awkward deliveries.